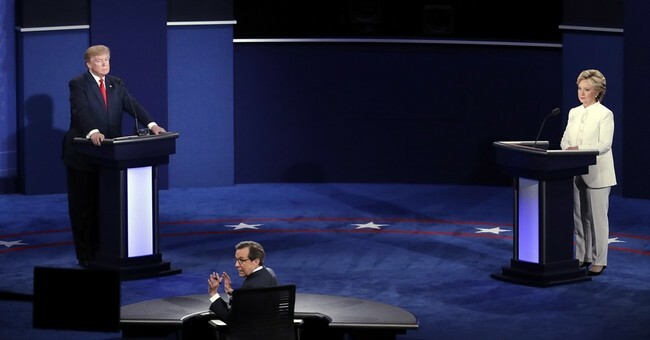 Wednesday night’s presidential debate focused on a variety of points regarding American trade deals—and what smart deals will mean for the country—with Donald Trump reiterating, with fervor, that NAFTA was the worst deal ever signed. The Peterson Institute for International Economics is a Washington, D.C., think tank, and like me, it favors free trade. Recently, the Institute developed a number of computer models based on the trade policies of Hillary Clinton and Donald Trump. According to the Institute’s models, both plans would lead to job losses, with Trump’s supposedly far worse than Clinton’s. The problem with these models is that they don’t take into account the value of negotiations. I would submit to you that a strong trade plan is not one of solely stiff tariffs, but comes with the harsh reality that countries like China and Mexico will have to sit down at the negotiating table again. The starting point for these trade negotiations will be tariffs. Certainly the aim of these negotiations is not to lose jobs in America; the desire is to create more jobs, as well as a fairer trade system. Trade deals negotiated in past administrations included a crucial assumption—namely, that the countries with whom we made these deals would ensure that our companies, manufacturers, firms and financial networks would be treated with the same fairness that their country’s companies would be treated. Computer models, textbook scenarios and politicians with political agendas are not the sole foundation of wise negotiations. Granted, they certainly should be considered as part of the formation of strong negotiating positions. But far too often, they are considered the only tools of politicians’ self-serving ideology. Many of these think tanks give us a great starting position. They provide us some perspective and financial data that are important as we begin to think about negotiations. They also provide a starting point for additional analytical data that will be necessary for formulating an end game. Yet we can get lost in computer models and scholarly analysis that overlooks real-life scenarios. In the beginning of the financial crisis, I talked about former Federal Reserve Chair Ben Bernanke being far too busy with his nose buried in textbook scenarios rather than having his ear to the street. By the way, very few of the textbook scenarios have been good for the economy. Just as we need politicians in a political structure who can start thinking outside the Washington, D.C., bubble, we must consider trade negotiations that occur outside the biased framework of career politicians. The negotiating skills and attitudes of someone who is not a politician—especially someone with the “elegance” of a New York businessman—may not be very appealing in the world of academia or elitist politics. But the upside is that it’s also not very appealing to politicians in other countries who want to negotiate with us—especially those countries that are not accustomed to dealing with negotiators who come to the table from a position of what is right for America, rather than their political agenda. Before we begin adding up the jobs that might be lost, we must consider what can be created when the strongest economy in the world begins to negotiate from a position of strength.